Riccardo Muroni (1980) was born in Sassari lives and works in Turin. He define himself as a multimedia artist. The technologies are tools used in different ways depending on the type and faced speech. ... "I'm very often working with different media such as video, installations and physical creations of sculptural objects" ... The space, the size, the time are principles that coat and settle in his works and the sense is only a pretext for the creation, the true understanding is the polysemic character of the structures created. If the shadow is the two-dimensional projection of a three-dimensional reality, the video is the projection of a four-dimensional reality. 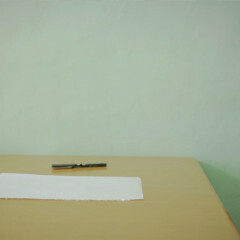 If the shadow is the two-dimensional projection of a three-dimensional reality, the video is the three-dimensional projection of a four-dimensional reality. In this place of four-dimension, an object is moving in space, moved by physical forces. This object is seen as a random temporal generator. The chaos, as a result, becomes the sheet music by which a sound has the ability to de-contextualize a situation, removing it from its natural context, giving it an extra dimension, the mental, which lives only exclusively inside the art work. 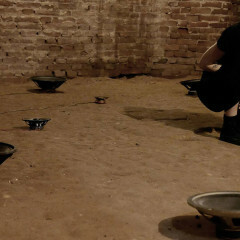 The installation consists of 10 videos made in 10 different situations and each associated with a different sound. The video formats are different, as well as the speakers connected to each monitor. There isn't any time reference (the videos are looped independently) and there isn't any space reference because the videos could exist anywhere. All videos are without of the human component but all filmed in subjective. In this way (utopian) the viewer is transposed from her reality to mine. The situation is real but shifted because you never get an objective view of time and space. I'm the filter of my reality. 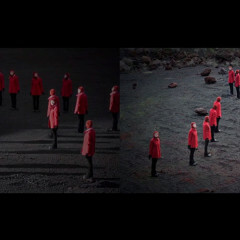 010 is the second video of a 3 video where the theme is the "space- time". It refers to new theories based on the existence of parallel worlds and universes, where we are not just us, but many of us. This goes on to deconstruct the anthropocentric conception of man because the human been, in relation to the universe, is nothing else that stardust. In general, my research, refers to the time as a real physical dimension that interacts with the space. This space is equal to itself, but multiplied. Added to this is the desire to create an environment where there is no beginning or end, where the filmic time is something that has a volume: a temporal stratification. I don't want tell a story but rather I need create a situation where the viewer is transported into a world without time and space as if it were a meditative exercise and in that place to find the true story that is not given by the video but from the atmosphere that creates the video. 010 is a “layered performance” over time, but in the same space: a pool of salt. On the ground there is a square that represents the crystal structure of "NaCl" (salt). The performer, is two atoms present in the salt: Sodium and Chlorine. These molecules are positioned at precise locations within the grid. In this dance the space is occupied in its entirety and then vanish into nothing, so that the cycle can repeat itself at infinity. Among the multiple branes of the chronotope, relationships are created in the same place but in different times; 15 shape are overlapping in a two-dimensional plane (the frame video). A shape superimposed a other shape like the pages of a book where each page is a differenta spacetime for create a illusion of an extra dimension. The object is to create a no-place where time and space are absolutely relative and the "action" have lost the own sense in the our space known, but an other meaning in a mental multidimensional space. The ordinary surfaces, defined as surfaces that in everyday life we are accustomed to observe, always have two "sides" (or rather, faces), so you can always go ideally one side without ever reaching the second, except through a possible line of demarcation formed by an edge (called "edge"): consider, for example, the sphere, the torus, or the cylinder. For these surfaces, it is possible to establish a conventionally side "upper" or "lower" or "internal" or "external". In the case of the Möbius strip, however, this principle is lacking: there is only one side and one edge. After driving around, we are located on the opposite side. Only after two paths we find ourselves on the leading edge. So for example you could move from one surface to the "back" without crossing the tape and the rim without jumping but just walking for a long time. Mobius is a metaphor but it helps me to explain words like: "change", "cycle", "path" that which is contained in Mobius. When you pass a cycle you never get to the end point (which coincides with the starting point) equal to how you have started, because path means change, mutation. A path that each cycle don't changing, that draws both outside and inside in an endless loop where apparently there isn't evolution. AP-206 // VP-333 is a audo-visual research between performance and video art. As in the sound is fundamental the time, in the video is the primary the space. The combination of the two dimensions, makes the chronotope (graphic space-time). On this "time-space grid" there are the two stories. The place is the same: the beach of Piscinas, Sardinia one of the largest deserts in Europe. The time is the same: the sunrise. The frames are stationeded in the east (AP - 206) and the other in the west (VP - 333).